Truly sublime food writing tends to incorporate numerous elements, from practical preparation tips to graceful ingredient description to memories and historical detail. 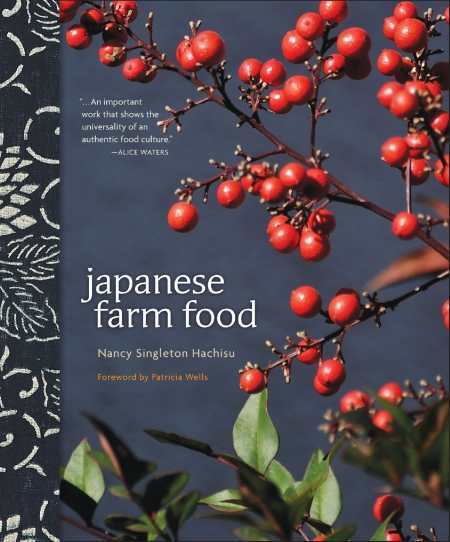 In her sumptuous exploration of Japanese dishes, Nancy Singleton Hachisu expertly blends all of these, creating a memorable collection that will appeal not just to cooks but to anyone who appreciates a simple, lovingly prepared meal. The bulk of Japanese Farm Food involves recipes, but Hachisu provides much more than a conventional cookbook. Instead, she weaves insights about certain vegetables, fruits, and meats together with small stories about each dish. For instance, before a recipe for stir-fried snap peas that includes miso, she recalls how she thought to combine the two flavors: she had a craving for miso on the same day that an eighty-five-year-old neighbor sent over a box of snap peas because, she admits, “we are imperfect farmers,” always missing the window for pea planting. That story, and many others like it, conveys a sense of Hachisu’s life while imparting valuable advice about flavor pairings and dish preparation. Much like a skilled-yet-easygoing chef, she’s always willing to admit her missteps in an effort to prevent others from making the same stumbles. In terms of the recipes themselves, there are some ingredients that may require a trip to an Asian grocery, but Hachisu is adept at suggesting alternatives (for example, a cook can substitute cilantro for mitsuba leaves), and best of all, she concentrates mainly on ingredients that are easily obtainable in North America. Because of Hachisu’s emphasis on simplicity and freshness, many of the recipes have only a few ingredients, and although some dishes might seem complicated at first glance, her directions are so straightforward and focused that even easily flustered cooks should have no trouble executing them. Photography by Kenji Miura accompanies the recipes, and those showing Hachisu’s farmhouse are particularly stunning. When combined with the book’s unvarnished pages and Hachisu’s warm writing style, the overall effect is nourishment on many levels. Although it’s likely that the recipes here will result in delicious dishes in anyone’s home, Hachisu also provides comfort and sustenance, without a single step toward the kitchen.